When working in construction, or even if you do a lot of home improvement yourself, one of the most repetitive jobs is putting nails into wood. But luckily, you can use a nailer to do all of the hard work. There are different types of machines for the job, though, and with the option of a finish nailer vs brad nailer, it can be difficult to know what you need. In this article, we will be explaining what they are and the difference between nail guns to help you make your choice. A nail gun is a tool that drives nails into the wood so you don’t have to do it manually. They are normally powered by compressed air or gas and are a great replacement for a hammer on a work site. Other types are also available that are powered by explosive powder, by electrically coiling a spring or by using a solenoid. However, these are far less common than the compressed air versions. Brad nailers are nail guns that are designed to work with 18gauge fine wire brad nails. 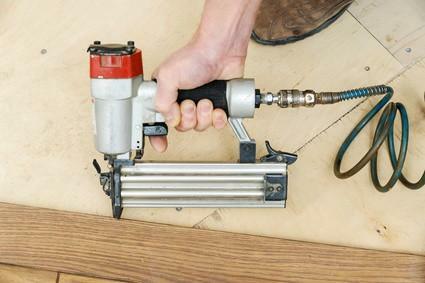 They are particularly tricky to drive into wood manually, so a brad nailer is a virtual necessity if the project you are working on requires these types of nails. They are small and fiddly, and once they are in the wood they are almost invisible to the naked eye, so you benefit from not having to worry about covering them over. Their smaller size, though, means that they don’t provide as much strength or hold as other nails. So what are brad nails used for? The most common uses are for installing baseboards, window casings, door frames and chair rails. Finish nailers, on the other hand, are designed for larger, bulkier jobs that require more strength from the nail. They typically use 15 or 16-gauge finish nails, which are noticeably bigger than brad nails but can range down to 10 gauge (with the lower the number indicating higher strength). The larger size means that you will be more likely to be able to see the nail once it is in the wood, so you will probably need to use some putty to cover it up. You do, however, get a much stronger hold than you would with a brad nail. The most frequent use for finish nails is to attach a trim or moulding to a room, and other lightweight projects. They are not designed to be strong enough for load bearing uses, though. When Should Brad Nails or Finishing Nails be Used? Both types of nails are designed to be smaller than other types of nails to allow work on smaller objects with an element of discreteness. Both Brad nails and Finishing nails carry out a similar function, but there are times when one is better than the other. In fact, if you are a tradesperson or a keen DIY enthusiast, you might find you’ll need to have a Brad Nailer and a Finishing Nailer to ensure you have the right tool for the job. To make sure you are performing your DIY project safely, check our tips on woodworking project precautions. Brad nails are slightly smaller than Finishing nails. They are a thinner gauge that makes them ideal for attaching lightweight trim and won’t leave any noticeable marks when you’re finished, so you don’t need to cover them. They really don’t bear much load, though, so must only be used to attach light objects like adding wood trim to wood. Finishing nails are a wider diameter than Brad nails, so are much better suited to holding heavier and larger pieces of wood in place. A finishing nailer is useful in a wider range of scenarios than a brad nailer, because the nails are so much more versatile. Finishing nails, for example, are a much better choice for attaching a baseboard to drywall because drywall isn’t a very solid structure to attach something to and a brad nail will easily come out again. With the extra support given, there are two downsides to using finishing nails. The first is that they are more likely to split the wood, especially if you are working with delicate varieties, and the nail head is a lot more visible so you will have to conceal it by using a putty or similar product. If you are doing a lot of work around the home, a finishing nailer will be more useful across various jobs, but ideally, you will have one of each so you have the perfect tool for each need. Finish Nailer vs Brad Nailer: Who Won? Nailers can save a huge amount of time and effort during construction because they drive the nails firmly and securely into place with far less chance of them bending. Different nails are suitable for different jobs, though, so you will need to know what you’re working on if you’re weighing the decision between a Finish Nailer vs Brad Nailer. In all likelihood, you will need both, but if you need to choose between the two, a Finish Nailer has a much wider range of uses.